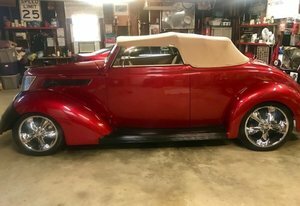 This 1937 Ford Club Cabriolet is all steel, fully insulated, and is finished in a show quality Porsche Red with complimentary Tan Leather interior. Chopped 2 inch body gives her that low lean look every Hot Rodder craves, and with a 383 stroker small block with rebuilt turbo 350 transmission she’s got plenty of power to take you far and near. Carson removable top, all new glass, all new hoses and lines, Heidts front independent coil over front suspension, Ford 9 inch rear end, front and rear sway bars, rack and pinion steering, and new rear exhaust. Only the best Ron Mangus custom Tan leather interior. Stuart Warner gauges, banjo steering wheel, column shift, power windows, and Vintage AC. 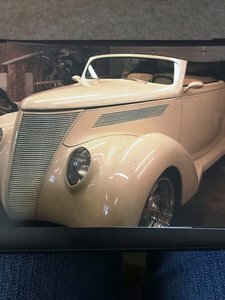 This is a beautiful classic Cabriolet, just perfect for the upcoming Spring and Summer outings. Offered at $83,500 OBO.